The TFP lion agreeably unites three qualities: strength, movement and agility. The lion does not give the impression that he is very heavy, carnivorous or ferocious. On the contrary, he demonstrates elegance, aristocracy and strength. He is a lion that knows how to be a Crusader. Taken together, these elements give the lion charm. The red background is alive and speaks of the plenitude of life, which is victory. Another element is the lion’s tapered waist. He does not have a pronounced stomach, but rather his bust sprouts from his waist like a fountain. His legs are open, symmetrical and elegant. That which enchants and enthuses has a grand charm. This is the grand charm of the TFP lion. The preceding article by Plinio Corrêa de Oliveira was translated and edited for publication without his revision. –Ed. 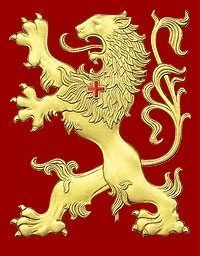 This entry was posted in Who We Are and tagged Counter-revolution, crusade, heraldry, TFP, TFP heraldry, TFP lion, Tradition family property by Plinio Corrêa de Oliveira. Bookmark the permalink.